Information Governance … the new eDiscovery?! Our LTNY 2014 word cloud reveals information governance (IG) as the most mentioned theme this year. This comes as no surprise as the adoption of effective IG has become critically important to law firms from a compliance, risk management and efficiency perspective. In turn, law firm clients are looking to see how their outside counsel govern their information in light of increased regulatory requirements for personal health information as well as a bevy of information of big data origins. Based on a few initial vendor conversations today, the lines of eDiscovery (EDD) and information governance are blurring. Established EDD vendors are adding IG tools to the collective toolbox in response to clients’ challenges to establish sound IG frameworks to in turn comply with their clients’ demands. We are particularly looking forward to ARMA’s track and three dedicated sessions focused on ‘IG secrets of successes for strategy and action’. In total, we counted 14 IG-themed sessions and 23 LTNY exhibitors (out of 220) focused on various information governance products and services ranging from secure data storage to email archiving and IG process and workflow management. Exterro Launches Fusion Employee Monitor™: Exterro Inc., the leading provider of workflow-driven e-discovery software, today unveiled Fusion Employee Monitor™, its newest application designed to mitigate the risk of corporate data spoliation caused by employment changes. Fusion Employee Monitor detects employee status changes to ensure that critical information tied to business activities, legal matters or regulatory actions is adequately protected. Read the full release here. LexisNexis launches Firm Manager … a new application for law firm practices management in the cloud. The product is designed for small law or independent attorneys and has been in beta for more than a year. Read the full release here. HP Autonomy Extends eDiscovery Platform to the Cloud: HP Autonomy today announced a new cloud-based eDiscovery offering that provides law firms, partners and small and midsize businesses (SMBs) with a fast, easy and cost-effective path to leverage HP Autonomy’s market-leading eDiscovery platform. Read the full release here. LegalTech New York is here, again. The Super Bowl and Groundhog Day are over; the snow is here, so it must be time for another LTNY. This year marks our 15th LegalTech attendance and if you aren't able to be on-site with the 1,000s of attendees, 200+ vendors and countless legal technologists, consultants, media/bloggers and influencers from literally all over the place, tune in to our daily LTNY reports and recaps. To kick-off our 2014 edition, here’s our short list of pre-show topics, sessions to watch, trends to notice and conference stats. LegalTech or eDiscoveryTech?! We have long tracked and reported on the trend of eDiscovery vendors taking over LTNY and 2014 is no exception. 82 of the 216 registered vendors (38%) touting eDiscovery solutions vs. 41% in 2013. 30 of the 64 sessions (including keynotes and plenaries) are EDD-themed and 11 of those are solely focused on the buzz around predictive coding and technology assisted review (TAR). 65% of the official LTNY educational sponsors are eDiscovery product and service providers. Big Data: Ready for prime time? We’ve likened the interest of legal big data in 2012 and 2013 to a ‘first date’ ... lots of uncertainty and nervousness about what’s next. Consider the 2014 ‘big data and legal’ relationship a serious one. New big data technologies are steadily emerging and established eDiscovery vendors are increasingly joining the big data mix with ‘industrial strength’ enterprise search and predictive coding/TAR technologies ready to assist legal professionals with more than ‘just’ tackling gargantuan sets of documents. Of the 7 dedicated big data sessions spanning two educational tracks by the same name, only three are not TAR/predictive coding themed, so the big data = eDiscovery stigma is still alive and well. 10 LTNY vendors are what we would label big data -- spanning predictive analytics and search, legal spend management and machine-enabled data processing. We did not include eDiscovery companies in this count, some of which are starting to promote aforementioned big data processing capabilities. Information Governance: The LTNY 2014 agenda word cloud cites information governance (IG) as the hottest topic based on educational content covered in 14 IG-themed sessions. Consider IG as an umbrella topic including risk management, IT security, governance policies/procedures and privacy. Governance is an ‘equal opportunity’ hot topic, challenging law firm CIOs and other C-Levels, GCs and CISOs to come together and devise best policies and practices to protect their own and their clients’ information interests. We also counted 23 LTNY exhibitors focused on various information governance products and services ranging from secure data storage to email archiving and IG process and workflow management. The cloud all grown up: Law Technology News’ latest cover story features Thomson Reuters’ new president and her quest to accelerate development of the company’s cloud and mobile technologies. Last month, LexisNexis published its “Cloud Technologies in the Legal Industry” report citing that 72.4% of the surveyed attorneys say law firms are more likely to use the cloud in 2014. These numbers also jive with what we analyzed and reported on in the 2013 ILTA/InsideLegal Technology Purchasing survey. So what’s next: Like we mentioned in our LTNY word cloud post, the time for talking is over with the focus on real world cloud applications beyond DR/BC and storage. David Whelan, manager of legal information for the Law Society of Upper Canada, also says so in his recent LTN piece ... “mobile apps are enhancing lawyer productivity and new tools are emerging to manage and integrate cloud services with existing web-based legal technology.” There are 17 companies offering practice, case and matter management products, some client-server but many of the being offered in the cloud or via SaaS model. Sessions worth getting up for: With 58 educational options, as well as a daily keynote and plenary session to choose from, it might be tough to narrow down the ‘best bang’ for your educational buck. · Total Cost of Ownership - Cloud vs. Premise: An Appellate Court-Style Debate [Wednesday, Track 7, 2:15-3:30]; Should I choose cloud-based software or software that’s installed at my office? · Day 3 Keynote: Privacy and Security [Thursday, 9:00-10:00]; The biggest challenge facing all of legal, co-presented by ILTA Distinguished Peer Awards ‘Thought Leader’ winner Donna Payne. A must see! · Measuring for Value: Addressing the Challenges in Measuring Performance Quality In and Outside of the Corporate Law Department [Thursday, Track 1, 10:30-11:45]; Kia’s Casey Flaherty, Lex Machina’s Josh Becker and Reinvent Law’s Daniel Katz look at metrics that can fully measure law firm and vendor value and quality. Direct mail Noise: Is it worth it? We read a tweet last week of a legal professional exasperated with the barrage of vendor mailers and emails leading up to LTNY. He mentioned receiving 150+ emails/vendor communications and ‘I’m not even attending LegalTech”. We agree, vendor pre-marketing efforts are unprecedented this year. In fact, we have been collecting the ‘best and worst’ of the mailers and emails we have received ... done right, a mass email can actually solicit a positive response or a neutral delete. Done wrong (10 misspellings in a 50 word sales pitch or a 2000+ word ‘direct mail’ novel meant to ...) these expensive pre-show efforts can really back-fire and make sure you’ll be singled out, for all the wrong reasons. Our perfect example of what not to do is referenced above. That intro was the beginning ... of numerous errors and typos within the email introduction to their company. We do feel like we know them now! If you are in New York, we hope to see you this week ... on the exhibit floor, in conference sessions and keynotes, at the media and bloggers breakfast, or at Friday’s ReInvent Law event. So 2014 is the year of information governance and data (not necessarily 'big')... proactive risk management. How can we properly (legally/ethically/affordably) manage and control data? What is the intersection with eDiscovery and big data? ARMA, which in 2013 put together several high quality big data sessions, looks to be focused on information governance education in 2014. Big data made a big showing in 2013 but didn't appear in 2012 or 2011. This year, even though there are a 2 dedicated 'big data' conference tracks, the topic itself appears a bit muted. Our conclusion: Most sessions and content themed big data on the agenda are actually eDiscovery related - see predictive coding, technology assisted review, etc. After all, the main big data track sponsors are eDiscovery folks. Include 'analytics' and 'metrics' and the slew of info governance topics and a more well-rounded big data picture takes shape. What happened to law firm clients and corporate? Sessions focused on clients/serving corporate were a much bigger deal in years past ... a disappointing trend considering GC dissatisfaction with outside counsel is growing and not going away. Where did the big pricing discussion go? Remember AFAs? Session wise, LTNY seems to have moved on. The 'cloud' has officially left the building... but only in terms of being talked about and labeled. While everyone was talking about cloud solutions in 2011 and 2012, we couldn't find much talk of it in the agenda. Now, the true cloud focus is on real world applications beyond DR/BC and storage. 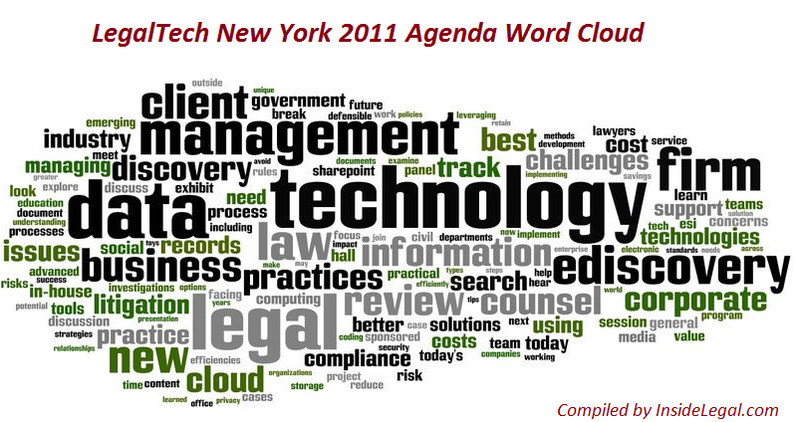 As a comparison, we have included the LegalTech NY Agenda Word Clouds from 2013, 2012 and 2011. Recently, the Legal IT Insider (formerly The Orange Rag) featured an article on big data in legal written by InsideLegal's Head of Content, Jobst Elster. Below is the content of the article. Last month, we attended LegalTech New York for the 14th year, and while many hot topics have dominated the headlines in years past, in 2013 it’s all about big data. Per our pre-show LegalTech agenda word cloud, big data was a main focus of the conference content agenda, surprising since it was a ‘no-show’ in previous LegalTech programs. What’s the big deal with big data? Why now? Who really cares? 1. De-mystifying big data: Just like cloud computing scared the daylights out of people less than five years ago (especially the security heads), big data is doing the same thing now. Since the biggest question with cloud computing in year one was “what is it?”, I suggest we start with Wikipedia’s big data definition: “In IT, big data is a collection of data sets so large and complex that it becomes difficult to process using on-hand database management tools or traditional data processing applications. The challenges include capture, curating, storage, search, sharing, analysis, and visualization.” The bigger point; before we all get high blood pressure re ‘BD’, let’s step back and start with a simple, yet useful definition. 2. What does it mean for law firms? Law firms don’t have a big data problem as much as they are challenged with what a big data world means to them, i.e., their clients’ big data issues. Firms will never reach a scale/capacity issue like government or Fortune 500 companies, but they will be expected to offer sound advice on data security, ethics, overall compliance and risk aversion as it relates to big data. A few US firms (i.e., Holland & Knight, Hunton & Williams and Goldberg Segalla) have taken the first step and opened separate practice groups (not necessarily profit centers, yet) focused on offering compliance and regulatory data management-geared advice. 3. Big data and technology: Currently, big data is not always or primarily associated with technology, but it has potential if legal application and service vendors band together to re-educate the legal community on business intelligence and analytics tools. No lawyer gives a hoot about OLAP cubes and data decision points but providing them insight into their business with meaningful metrics will garner a favorable response. The same goes for relating the corporate big data challenge in terms they feel good about sharing with others. Use technology as an aid, not a crutch and start with minimal workflow disruption, a relatable interface and the ability to share and collaborate with colleagues and clients. 4. Who’s in charge? Gartner predicts that by 2017, the CMO will control corporate IT budgets and will be a key stakeholder in the big data equation. If this is remotely true, will this potential seismic shift force marketing and IT as well as compliance to all play nice and work together? Can’t IT help marketing push the envelope when it comes to data mining and client profiling by designing more useable analytics tools? And can’t the chief compliance officer clearly communicate security and ethical requirements with the expectation that related alerts and triggers are built into the technology to avoid risky activity? 5. What does it mean for legal vendors? Beyond building smart technology, legal vendors should focus on making their technology produce more accurate, predictable results. I had great conversations with Pete Mancini, cicayda’s data scientist, who firmly believes that “the confidence interval between one analysis and another is really what will differentiate systems and adoption.” He added that discussions with prospects and legal leaders made it abundantly clear that confidence in results is more important than anything else. To his point, I think analytics systems and even eDiscovery tools and enterprise search engines have all been too wrapped up in the process of what they set out to do versus simply doing what they advertised. 6. Current status: InsideLegal took to the LTNY exhibit floor to ask legal vendors what they thought of big data and how they were addressing the challenge. We received blank stares and nervous laughter and this coming from established ‘household name’ vendors. If the technologists don’t know what they are dealing with, how can they assist their clients in navigating through the rough big data seas? 7. Big data and security: The CISO (chief information security officer) is evolving into one of the key folks in the board room, especially as cloud deployments, big data, mobile lawyering and security in general continue to gain relevance in the legal environment. The CISO, currently more typical in corporate settings, is responsible for information-related compliance, handling everything from information security to risk management and disaster recovery/business continuity. Conference upon conference, the topic of security keeps creeping up to the top of the CIO’s ‘challenge’ list without much relief in sight. ‘Installing’ a CISO position not only adds accountability, but sends a clear message that security is job one at the firm and now someone besides the CIO has a vested interest in compliance and risk management. 8. Big data and searching: Coping with big data, whether on the corporate or law firm side, will become much more manageable once search technologies evolve to become discovery platforms. In this scenario, system users don’t have to know what they are looking for or input specific key words to have search success. Other parameters, factors and characteristics are all evaluated and processed by an intelligent discovery tool that gives you the real information you are after. Military intelligence has been relying on discovery (vs. search)-based models for decades and, slowly but surely, a comparable level of sophistication is making its way into the private sector. 9. Data hoarding: The cloud is NOT the answer for storing unlimited data, especially ‘dark’ data that we keep around just in case we’ll need it later (does your Outlook Inbox or archive remind you of this?). The eDJ Group recently completed its Defensible Deletion Survey and reported that 96.1% of respondents (out of 430 participating information governance professionals) agree that defensible deletion of information is necessary in order to manage the exploding volumes of digital information, while 37.3% indicated that lower priced cloud-based storage options present a long term information hoarding solution. 10. Do(n’t) believe the hype: The big data hype is based on numerous opportunities to positively affect law firm business through better information sharing, information access and, most important, acting on the information we are given. 15+ years ago data warehousing was all the rage – today it can be information proliferation — using data continuously (as a steady flow versus periodic trickle)to help make smarter decisions instantaneously versus saving the data, storing it and hoping we can at a later point in time remember to retrieve and then use it. Note: The Legal IT Insider has recently gone through a complete renovation. Soon, we will be covering the new look and layout along with all the helpful features and tools at your disposal through the site. In the meantime, at least ensure that you are on the subscription list to receive the digital newsletter free of charge. We have for the most part shaken off our LegalTech NY (LTNY) hang-over so are now well positioned to share additional insights and goings-on from last week's legal technology bonanza. big data is not 'just' an eDiscovery problem? ... big data does not mean business intelligence and analytics only ... big data is a massive challenge for corporations and law firms alike because of the dreaded dark data (old stuff we keep around 'just in case') ... opinions differ on who should drive the BD bus -- the chief compliance officer? CIO? CISO? or maybe even the CMO, especially if the big data benefit is better client segmentation and profiling ... big data can be structured and unstructured, the key issue is what to do with it, how to handle it and how to police it. You get the picture, this topic is filled with intrigue and ARMA's sessions helped underscore the associated threats and opportunities. Big data is the next buzzword that will definitely not fizzle or fade for a while to come. Emerging legal roles to keep an eye on. On a recent webinar hosted by One North Interactive and Goodwin Procter's marketing director, we were introduced to the emerging legal interactive marketing role of content curator and content merchandiser (organize and manage legal content like your grocery store products). That started us thinking about what additional 'new' job titles we'd encounter in New York. The CISO-chief information security officer (not to be confused with Cisco (NASDQ: CSCO), Sysco (cafeteria food) or Sisqo (thong song)) is evolving into one of the key folks in the board room, especially as cloud deployments, big data, mobile lawyering, and security in general continue to gain relevance in the legal environment. The CISO, currently more typical in corporate settings, is responsible for information-related compliance handling everything from information security, to risk management and disaster recovery/business continuity. The other title we saw and had not heard much about is the data scientist or chief data scientist, not an evil doer in a white lab coat, but an oft numbers (and algorithm) obsessed smart guy (or gal) who likes to tinker with analytics and artificial intelligence. Of course, this is an incomplete description, but in legal, these guys are being hired by forward-thinking technology companies (mainly eDiscovery vendors) looking to advance their technologies and their clients ability to use them (and profit from using them). Data scientists interest us so we'll be profiling this persona a bit more in future posts. While big data dominated the sessions and overall show content, we (only) counted five vendors that centered their exhibit and booth presence around big data - IBM, EMC, StoredIQ, Content Analyst and Nuix. The last 3 of these are eDiscovery vendors. The largest non-EDD vendor category was by far practice management (we counted 15 vendors) including 4 newcomers per LTN - AgilePoint Inc., CLM Matrix, Doculogix Inc. and New Zealand-based ActionStep Software. The buzz of the year in terms of vendor promotions goes to Symantec, with the eDi$covery Cab, a takeoff of the Discovery Channel's hit game show, the Cash Cab which challenges players to answer a series of progressively difficult questions. LTNY attendees were able to test their eDiscovery knowledge in Symantec's eDi$covery Cab with Cash Cab host, Ben Bailey. In addition to the eDi$covery Cab, there was a food truck hosted by Symantec with free food for all who received coupons in the Symantec booth. Returning after a few years outside of the industry, was former CaseLogistix CEO, Roe Frazer with his new company, cicayda, a cloud-based eDiscovery supplier. The former CaseLogistix gang (Roe, CTO Jason Cox and Operations Guru Suzy Mills) is all about simple and easy to use interfaces (like what they did with CaseLogistix) and price disruption in the complicated world of eDiscovery pricing. At LTNY, cicayda launched their first product fermata, their secure, cloud-based legal hold product with simple, $5 per hold LTNY pricing as well as a 30-day free trial. The prize for 'is this really legal tech' in my book goes to AppearByPhone.com, a service that enables court appearances by phone for attorneys and judges alike. The service (making phone calls) greatly simplifies the process of court appearances without attorneys phyically being there. Maybe traffic in some parts is so bad, calling in a (legal) friend, is the best way to go. George Socha's Apersee website boasts a database of 1,200 eDiscovery providers that anyone looking for eDiscovery, litigation support or simply a shoulder to cry on can access and request service quotes. Providers can bid on jobs and projects, but based on what Socha told us, the early bird gets the worm with typical inquiries yielding 30+ responses within the first hour of posting. In addition to product/service listings, the site includes a 'news & events' section that features industry news, a press release posting section and an EDD event directory. At a minimum, interested companies should complete the free provider profile, which will add them to the database. Well-respected UK consultant Andrew Haslam of Allvision Computing, in conjunction with Legal IT Insider (which was recently consolidated and redesigned if you haven't seen it) is launching a free Buyer’s Guide to Litigation Support Systems. According to Charles Christian, the guide will "combine practical advice on system selection with the most deﬁnitive collection of vendor and software information in the UK ..." We met with Andrew in NYC and he mentioned that the ﬁnal stages of compilation are now under way and that the PDF guide will soon be available as a download from the Insider website. If you haven’t submitted an entry, email Andrew immediately. Lastly, the eDiscovery Matrix powered by the EDJ Group is a trusted resource for eDiscovery professionals and customers to quickly find, follow and compare legal technology software and services listed across a wide array of categories in an unbiased, moderated environment. The site states it is a transparent, dynamic research tool that should be in the arsenal of anyone in the eDiscovery industry. Being listed in the eDiscovery Matrix is free and can be completed here. We briefly spoke with EDJ's co-founder and principal analyst Barry Murphy about this and learned that free registration is the starting point to not only being recognized as an industry player, but also advantageous when working with him and his colleagues. Media & Bloggers Breakfast. As has become an InsideLegal tradition, our LTNY day 2 began with the 14th edition of ALM's editor's breakfast -- a informal 'meet and greet' where all attending ALM editors introduce themselves and their publications. This year's event was identical to past events and after the introductions, again translated into a 'feeding frenzy' with a room full of vendors (dare we say 50+ separate entities) seeking to pitch editors on their wares. While many publishers have doubled down on digital products and reader offerings, ALM is still print-heavy with all of the editors that showed up managing at least one print periodical (ranging from weekly to quarterly). Of course, law.com and Law Technology News' (LTN) online presence are the most prominent, but at least here, the printing press is still in use. Keynote fatigue. In our LTNY day one recap, we pondered whether the traditional keynote might be on it's way out the door and after having witnessed day 3's key address as well, I have to say it may be so. Don't get me wrong, I enjoy a thought provoking, intriguing, 'rally the troops' sort of kick-off but with some of these speakers and topics I really wonder what the motivation is. While Tuesday's senior law firm partner bored us with US justices factoids, Thursday's main act spent a mere 25 minutes talking about habits and motivation/rewards, an intriguing presentation, but too short. New York Times investigative reporter and author Charles Duhigg got us all excited with cute examples and videos of how changing habits can get the best out us, only to end it (with us hanging) upbruptly and saying his goodbyes. We weren't able to attend Wednesday's judicial perspective' talk show-style keynote, but by all accounts, it was well received. However, I still wonder if these hit the mark. If the idea is to motivate, excite, and give attendees a good reason to get up early after long hours at the bar, I don't think LegalTech's keynotes were the answer. eDiscovery or more… Yesterday’s post revealed the 2013 exhibitor breakdown and 6 year trending. 41% of all vendors in NYC are peddling eDiscovery wares, a 4% decrease from last year - seemingly due to last year's wave of M&A activity. Nonetheless, this reflects a 12% EDD vendor increase since 2008. Interestingly enough, we counted a 15% decrease in total exhibitors (262 in 2008 vs. 224 in 2013) during that same time span. So, for now, there’s no stopping the EDD train. Innovation & market disruption: When is the last time you went to LegalTech and witnessed true innovation, perhaps even market disruption, that left you gasping for air? While we can’t remember one ‘best of’ moment, Thomson Reuter’s WestlawNext launch in 2010 was pretty impressive, if primarily from a production standpoint. While we admittedly only spent 30 minutes or so on the exhibit floor today, a thorough review of the show guide and several conversations with fellow conference goers confirms that nothing super cala fragilistic expialidocious will emerge from the 31st edition either. Content: Did anyone say Big Data? 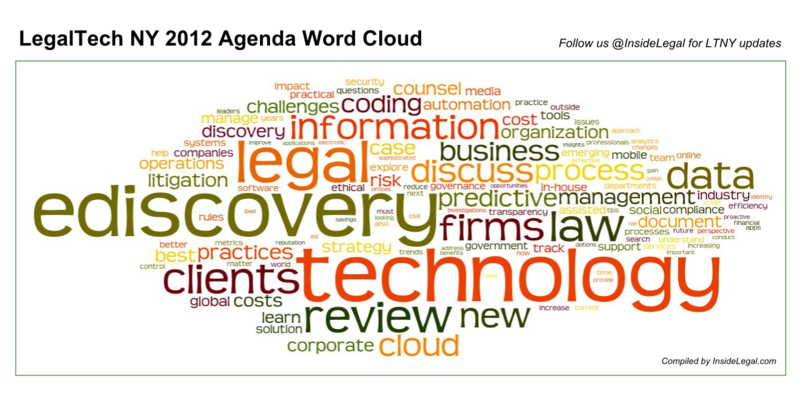 You can take a look at the word cloud we compile each year from the LTNY agenda and see the focus on Big Data. Last year, the term Big Data wasn't mentioned on the LTNY agenda, but this year 3 of the 21 LTNY session tracks and 9 of the 58 conference sessions are Big Data themed. ‘Making Big Data Meaningful for the Legal Market’ looks at practical applications of ‘BD’; ‘Big Data and the Business of Law’ tackles analytics and related decision making; and ‘Information Governance in a Big Data World’ analyzes the risks and rewards of leveraging (or stopping to ignore) big data. Commercialization: Anyone following our past LTNY coverage, knows we are not big fans of toilet sponsorships (I think that happened in 2010), but the reality is that ‘logos everywhere’ is the status quo. With that said, we know, as usual, big $ was spent on track sponsorships - 21 tracks had 20 vendor sponsors, 17 of which were EDD. In addition, 17 of the 25 sponsors (68%) of this week’s keynotes, plenary sessions and super sessions are EDD vendors. Getting back to sponsorships, on our way to Tuesday’s keynote we were handed Huron’s "We See Things Differently" 3D glasses (haven't seen the special effects yet) and greeted by numerous eDiscovery adverts including Kroll Ontrack’s elevator door sponsorships and literally being interrupted in the middle of a meeting by someone handing out ESI Roundtable logo flashing necklaces in the common areas of the hotel. Global appeal: How many non-US vendors and companies are here? We counted a handful and noticed a few newcomers from across the pond. But, based on insight from Charles (‘yes, I really am not in NY’) Christian of the Legal IT Insider, the UK delegation is smaller than usual with many European legal IT professionals opting to travel over for the ILTA Conference each year and check out LTNY every few years. This seems to be the consensus as at least 5-7 UK contacts that we typically meet with each year aren't in attendance this year. Meeting space: To any one reading this that hasn't experienced it, this might come off as trivial, but not having options for meeting folks while onsite is a real fail. LTNY is notorious for having very little open meeting space and 2013 is the worst case scenario. The popular Marketplace restaurant and adjacent Starbucks (where we conduct 60% of our meetings) are closed for renovations. The Bridges Bar where normally people go to meet and conduct business has been temporarily converted to a breakfast and lunch spot (just during LegalTech) which requires full meal purchases. I realize that's additional revenue, but it would have been much better had LegalTech left that space open for meetings as there are plenty of options to grab a meal within a block of the hotel. Also, it would have been really helpful to have a heads up before the event for alternate plan making. Of course we are resourceful and have forgiving and flexible meeting partners, but being worried about finding an empty chair is one problem that can easily be avoided. We scored a table in the lobby area today and had no less than 12 desperate people come to ask us if we would be leaving any time soon. It was a mad house! Is the keynote dead… The keynote today was given by a senior Am Law 100 partner talking about the U.S.’s supreme court justices and their race, religion, political affiliation, university training, etc. and did not really fit the conference's theme of technology. In fact, technology was only mentioned once - "Everything I need to know about legal technology, I get from my granddaughters." Based on what we heard at the keynote today, the concept should be ‘revisited’ or the model changed to really promote high quality, appropriate content. Stay tuned for our verdict come Friday’s ‘post’ post.